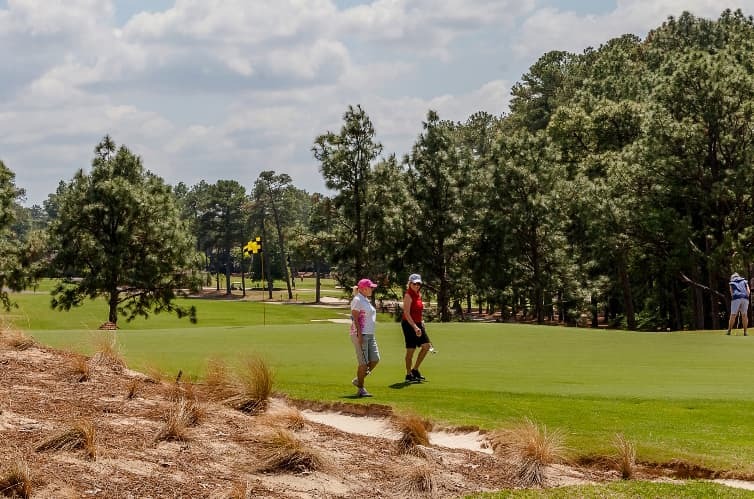 VILLAGE OF PINEHURST, North Carolina – In the championship match of the 115th Women’s North & South Amateur, Isabella Fierro missed just one fairway on Pinehurst No. 2. She made up for it with the best shot of the championship. The 16-year-old Mexican phenom rode through all of the highs and lows that the game of golf can sometimes require and came out of them with a brilliant closing stretch of eight holes to beat North Carolina native Anna Redding 2&1 on Friday. Fierro is the first Mexican-born player to win the historic tournament. In a wild match that felt like it had more lead changes than your typical Duke-Carolina game, Fierro was down after the first hole, led 2-up after the fourth hole and then found herself trailing 2-down after the eighth hole. Fierro, though, evened the match after making a slippery 4 ½-footer for par to win the 11th hole, then took a 1-up lead after a beautiful approach on 12. Fierro was 10-for-10 hitting fairways in regulation at that point, but her drive on 13 just tricked into the left native area, about a foot off the fairway. She was left with a testy lie under a wiregrass bush while Redding was in the middle of the fairway just 135 yards from the pin. Congratulations to the 115th Women’s North & South Amateur Champion, Isabella Fierro. But after Redding misfired left of the green on her approach, Fierro could feel the pressure ease off. Trying to scoot the ball up the middle of the green, Fierro made solid contact and the ball landed softly on the front of the green, rolling pin-high to about 8 feet. She curled in the putt and found herself up 2 holes once again. Redding made a clutch birdie from 15 feet on the par-3 15th to draw back within one, but Fierro was able to reach the front fringe of the par-5 16th in two shots and two-putt for birdie to win the hole, taking another 2-up lead at the 17th tee. She made a par there to make Pinehurst history. Not that Fierro isn’t accustomed to winning big tournaments. She recently won the South American Women’s Amateur by 10 shots and will travel from Pinehurst to Switzerland to play in the European Ladies Amateur Championship later in July. Fierro has also won the Mexican National Amateur and the Copa Yucatan. The loss in the final was a tough one for Redding, the 2013 Girls’ North & South Junior Champion. From nearby Concord, Redding has been one of the North & South’s elite players of the last three years, reaching the semifinals in 2015, the quarterfinals in 2016 and the championship this year – a run that included a thrilling 1-up victory over defending champion Kristen Gillman in the quarterfinals. “My ball-striking just wasn’t at its best today, and Isabella just played really, really well,” Redding said. “It was a great match. The Women’s North & South Amateur is the longest consecutively running amateur championship in the United States. North & South champions are among the legends of the game, and include Babe Zaharias, Louise Suggs, Peggy Kirk Bell, Hollis Stacey as well as Brandie Burton, Brittany Lang, Morgan Pressel and Yani Tseng. As much as the North & South is a championship with a great past, it also continues to foster a great legacy. Eleven of the last 15 Amateur champions have joined the LPGA Tour, four of whom have won major championships – Pressel, Tseng and Lang, who won the 2016 U.S. Women’s Open. 2011 Women’s North & South Champion Danielle Kang won her first major championship recently at the KPMG Women’s PGA Championship. No. 1 Kristen Gillman vs. No. 8 Anna Redding, 7 a.m.
No. 4 Beth Wu vs. No. 21 Lakareber Abe, 7:08 a.m.
No. 15 Julienne Soo vs. No. 7 Isabella Fierro, 7:16 a.m.
No. 19 Sandy Choi vs. No. 6 Aneka Seumantutafa, 7:24 a.m.